MINNEAPOLIS – It’s right there in the lyrics. The road is long. As “One Shining Moment” played at U.S. Bank Stadium, the theater for what unfolded as a thrilling National Championship Game, the words leading to one of sports’ great success stories filled the air. The road is long. No one knows that better than Virginia. The Cavaliers completed their year-long journey on the road to redemption on Monday night by winning the program’s first National Championship with an 85-77 overtime victory against Texas Tech. 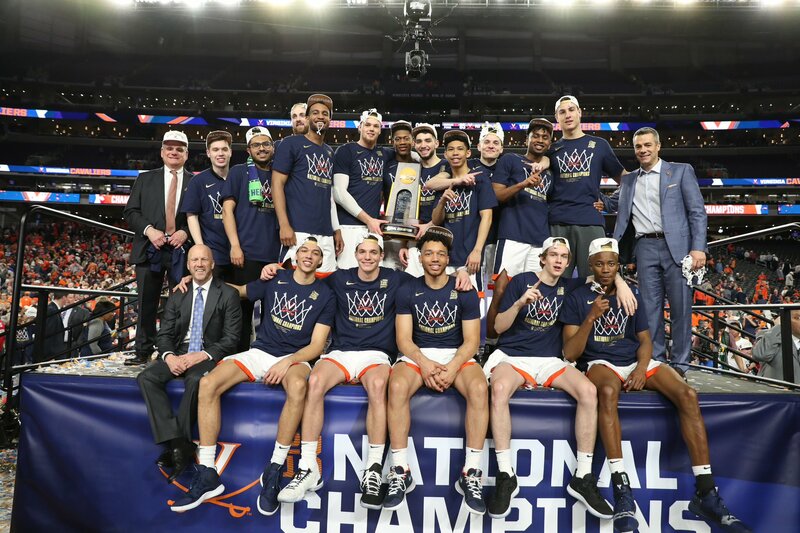 That path started with a historic loss to UMBC as the first 1 seed to lose to a 16 seed and wound its way to Minneapolis where confetti rained over the Hoos as the National Champions. The Hoos didn’t take any shortcuts and focused on each step of the way on the journey in between. The title came with one last round of drama. For the third straight game, Virginia trailed in the final 30 seconds of regulation but found a way to come through in the end. Against Purdue in the Elite Eight, it was Kihei Clark’s laser pass finding Mamadi Diakite in just enough time to force overtime.. Against Auburn in the Final Four, it was Kyle Guy sinking three pressure-packed free throws to secure a win in the final second. And, finally, against Texas Tech on Monday, it was De’Andre Hunter’s turn. The sophomore forward knocked down two critical 3-pointers to help his team win. Near the end of regulation, UVA trailed 68-65 in the final 20 seconds when the ball found its way to Hunter for a corner 3-pointer with 14 seconds to go that forced overtime. Then with the Hoos trailing by a point halfway through overtime, he lined one up again from nearly the same spot and drained it to give Virginia the lead for good. Those two baskets provided an exclamation point on what was an incredible showing for Hunter. He poured in 22 points in the second half and overtime, which pushed him to a new career high. Hunter finished with 27 points on 8-of-16 shooting to go with 9 rebounds, 1 assist, and 1 steal. He made just 1 of 8 shots in the first half, but shook that off to make 6 of 7 shots after intermission. Hunter said he just made sure to be assertive. Hunter got plenty of help carrying the offensive load against the Red Raiders. Running mates Kyle Guy and Ty Jerome also came through with big games in the biggest game of the year. Guy played all 45 minutes and scored 24 points to go with 3 rebounds and 1 steal. Jerome tallied 16 points, 6 rebounds, and 8 assists. When you add the lines up, he trio accounted for 67 of the team’s 85 points. Mamadi Diakite added 9 points, 7 rebounds, 2 blocked shots. UVA shot 45.8% overall and from the 3-point line. The Hoos made 20 of 23 free throws. They also came up with 16 second chance points courtesy of 11 offensive rebounds. The Cavaliers needed all of the production they could find since Texas Tech came into the game as the nation’s leader in defensive efficiency. TT allowed 0.860 points per possession this season to lead the nation. Virginia torched the Raiders to the tune of 1.29 ppp, though. Jerome orchestrated much of the success with repeated drives toward the rim that often collapsed the defense before he found an open teammate somewhere on the outside. Defensively, Virginia tried to be on Texas Tech as fast as possible too. UVA did a good job slowing down two of Tech’s biggest weapons. Matt Mooney had 10 points and 3 assists on 4-9 shooting. 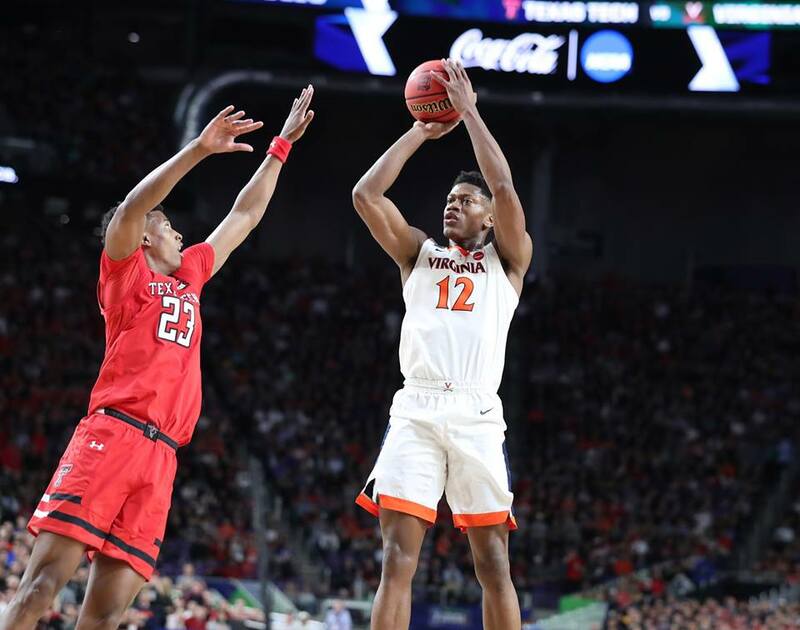 Jarrett Culver had 15 points, 9 rebounds, and 5 assists but the Hoos made him work for it. Culver made 5 of 22 shots, thanks in large part to Hunter’s ability to defend, though Culver did beat him with a spin move shot with 35 seconds to go in regulation that put Texas Tech in the lead at 66-65. Culver couldn’t repeat that feat at the end of regulation, though. Culver tried to win it with one second on the clock, but Braxton Key blocked it to create overtime. That was part of a solid performance for Key. He notched 10 rebounds to lead both teams and finished with 6 points and 2 assists. The Cavaliers held the Red Raiders to 42.9% shooting (33.3% from 3-point range). For Virginia, it was also the conclusion to a great comeback. One year after that historic UMBC loss, the Cavaliers won a program record 35 games and captured the national title. They did it in improbable fashion at the end of three different games too. While that doesn’t erase what happened a year ago in the NCAA Tournament, the Hoos learned to make that part of their story and not their defining moment. That one came in Minneapolis. Kris – Fantastic work as always. It does erase it. Wahoowa! To a certain couch to the south of C’ville, this is kourage and class. You don’t develop it by bringing in a series of extraordinary players that are the best in the land and used to the glamour of stardom. You bring in players that have work to do, that have to rely on a cast of teammates in order to be at their individual best. Most important, they will more than likely experience humbling defeats along the road to success. I just wish Marco A. would have showed more class and not danced like he was performing for those 72,000 fans when there was still 20 minutes of basketball to play, he looked foolish, then he plants himself right in the very center of the front row for this photo. I think he craves attention which is 180 degrees from Tony Bennett’s “be HUMBLE” message. If that is all I have to complain about, then I guess we hit it out of the park…Love these guys and thanks to Malcolm, Joe and Justin for getting this momentum started.